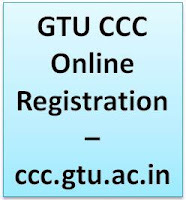 GTU CCC Registration start: Gujarat Technological University(International Innovative University), commonly referred as GTU, is a statewide institution affiliating many engineering, pharmacy, and management colleges and varsities across the western Indian Districts of Gujarat. The university is headed by the state government and came into existence on 16 May 2007 Earlier, Gujarat University was the prime university of Gujarat state heading all colleges including technical colleges. To ensure more efficient, and systematic imparting of technical education, the state government formulated GTU. GTU declares results all around from February to April for winter exams and all around from June to August of summer exams. Click on "Register" button at the end of Instructions. You can fill challan details afterwards by Login till Last Date for Edit Application. 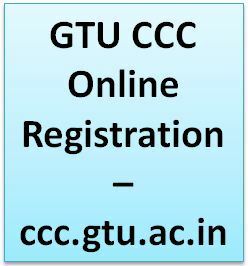 Submit filled form with attestation and attachment to GTU before Last Date of Hard copy submission. If you send incomplete form to GTU, it will be rejected.